Suran is ground into paste along with soaked moong dal. The mixture is then formed into discs and deep fried till dark golden brown in color. Serve yam moong vada immediately. 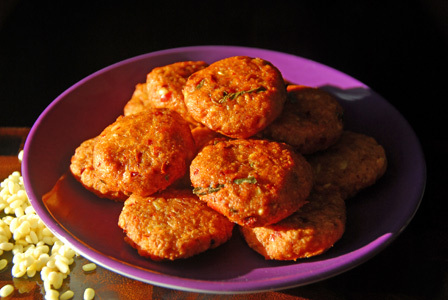 Makes: around 10 Yam Moong Vada. If using frozen suran, wash it under water and leave aside for few minutes. If using fresh suran, remove outer skin, wash and grate the suran. Soak moong dal in water for around an hour and strain the moong dal. Grind the red chiles into powder using a grinder. Add the soaked moong dal and grind again into paste without adding water if possible. Stir in suran, salt and grind again into paste. Remove the ground suran mixture onto a bowl, stir in cumin seeds and curry leaves. Take small lime sized portion out of the suran mixture. Lightly flatten it on the palm of your hand to form around 2 inch thin disc and carefully leave in the hot oil. Repeat the same till the surface of the oil is filled. Fry the yam moong vada till they turn dark golden color on both sides. Remove the deep fried yam vada onto a absorbent towel. Repeat the same with any remaining suran moong mixture. Serve yam moong vada immediately. Notes: Make sure not to add water while grinding the moong dal or suran. Suggestions: If the mixture is too runny, add few tablespoons of rice flour to thicken the mixture so it can be formed into discs. Variations: Check other variations with yam/Suran here. Other Names:Yam Moong Vada, Suran Moong Vada. Suran / Yam is peeled and boiled in water till soft. Cooked yam is then briefly fried along with whole spices and red chiles. Then the whole mixture is lightly mashed. Finally the mashed suran curry is finished with good amount of lemon juice. Makes: around 2 Servings of Suran with Lemon Juice. Yam is peeled, thoroughly washed and chopped into small pieces. If using fresh yam, boil chopped yam in salted water till yam is soft and cooked. Wash frozen yam (if using) under fresh water. When urad dal changes color, add cooked fresh yam or chopped frozen yam. Fry briefly, add few tablespoons of water and cook covered till frozen yam is thoroughly cooked and turns soft. Uncover, stir in turmeric powder and salt. Lightly mash the yam mixture with back of the big spoon or spatula. Cook for another minute on low flame and remove from heat. Stir in lemon juice and adjust salt if necessary. Serve suran with lemon juice over plain steamed rice and dollop of ghee. Notes: Make sure to cook suran well before adding lemon juice. Suggestions: Adjust lemon according to your preference. For extra spice, add sliced green chiles to the oil after whole spices are fried. 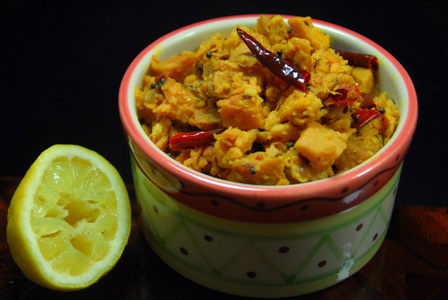 Variations: A tsp of split chana dal can also be added to the talimpu for light crunch. Other Names: Suran with Lemon Juice, Yam with Lemon Juice. 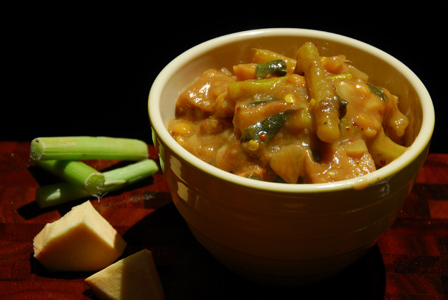 Elephant foot yam is a root vegetable which is used in making this sweet curry. The yam is peeled, chopped and boiled in salted water till its soft. It is then cooked in tempered oil along with chopped onion. Finally jaggery is added to sweeten the curry. Makes: around 4 Servings of Suran Sweet Curry. Peel and lightly crush the garlic cloves. If using fresh yam cubes, boil them in salted water till yam cubes are soft and cooked. If using frozen yam, microwave in quarter cup of water for 5 minutes. Heat oil in a sauce pot, add garlic cloves and all talimpu ingredients in order. When onion turns translucent, add cooked yam, jaggery, turmeric powder and salt. Cook covered on low flame till jaggery is dissolved and yam is almost mushy. 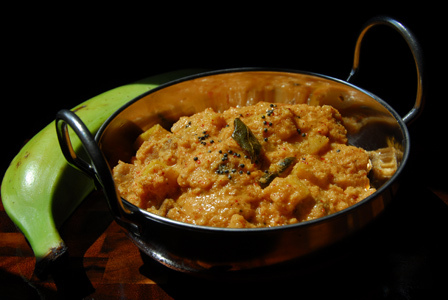 Serve suran sweet curry with plain steamed rice and dollop of ghee. Notes: Make sure suran is completely cooked before removing from heat. Suggestions: If yam is not cooked properly, add a splash of water and cook covered on low flame till done. Variations: You can also mash the yam before adding to the pan for a different texture. Other Names: Suran Sweet Curry, Kanda Teepi Kura, Elephant Foot Yam Curry. 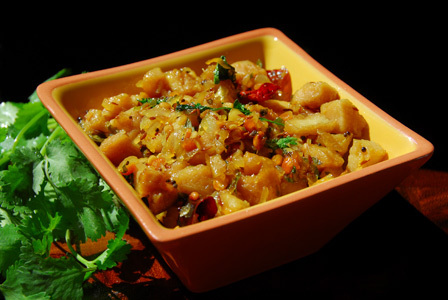 Erisseri is a gravy vegetable curry traditionally made in Kerala. It is done by cooking any vegetable or combination of vegetables in a spiced coconut gravy but normally done with either yam or plantain or both. Erisseri is generally finished with toasted coconut flakes. Best served over plain steamed rice, erisseri has thick gravy consistency. Peel, wash and chop yam into small cubes. Remove ends, remove skin and chop raw banana into small cubes. Heat a pan on medium flame, add a tbsp of grated coconut and fry till it turns golden brown and keep aside. Bring to boil a cup of water, add raw banana, turmeric powder and salt. Half way through the boiling, stir in yam (if using frozen) into the water. Cook till the plantain cubes are more than half done. If using fresh yam cubes, boil them in water along with turmeric powder and salt till yam cubes are almost cooked. Roast black peppercorns, whole red chiles on medium heat until aromatic. Switch off heat and add grated coconut to the hot pan. Cool the ingredients to room temperature and grind them into fine paste adding enough water. Combine both cooked yam and cooked plantain pieces into a pot. Add ground paste, sufficient salt and boil until the sauce thickens. Stir in the toasted coconut that is reserved. Once mustard seeds almost stop spluttering, add it to the gravy. Notes: Make sure both the yam and raw banana are completely cooked. Suggestions: Some like to use normal oil while cooking and garnishing with few drops of coconut oil. Other Names: Erisseri, Erissery, Erisery. Remove stems, wash and slit green chiles. Soak yam pieces in a bit of yogurt for later use. Peel the hard outer skin of amaranth stems. Soak tamarind in a cup of water for few minutes and extract all the juice. Dilute rice flour in half a cup of water without any lumps and keep aside. Once onion turns translucent, add yam cubes, amaranth stems, tamarind extract, jaggery and salt. Add more water if required and cook covered until yam and stems turn soft but not mushy. Uncover, add coriander powder, cumin powder and turmeric powder. Stir in diluted rice flour and once the mixture thickens a bit, remove from heat. Serve hot with steamed rice and ghee. Notes: Make sure yam pieces are cook through.